The prophets have warned us of a time that would come when God would judge the wicked and punish, or rather destroy, the wicked and give the earth over to the rule of a righteous people. So many of us have misunderstood just what we should expect. What will God look like? If we expect the destruction of the devil, what will the devil look like? How will I distinguish him? If the devil should be destroyed, what does that devil look like? In order not to follow him to his destruction I must be able to recognize him so that he won’t be able to deceive me. What world’s end will come, and what is that world that is going to end? Does that include everything that makes up the solar system? The planet earth? If so, what shall we expect? What kind of solar system will we have after the destruction of the present one? Think over these things. We must get down to the facts so that we can recognize them when they are presented to us. But you never questioned the first teacher. Shouldn’t we be fair about this? Let us go after the thing right! Where was Moses, and what time was that? What did the God have in mind? If no one has gone to heaven or seen the face of God, then all of these prophets, are liars. You must think these things over. You have a lot to learn if you understand it; otherwise, you are still in the dark as to the Truth. We are here to know whether God has visited America or whether He is yet to come. The hour can come at any day, because it is prophesied that it will come in any hour that you think not. Naturally, I had expected it to come at a certain day but the book said you won’t know the day nor the hour. If all of these signs of His coming are exhausted and I don’t see any end to the World, that is to show me that it could take place at any time. If there is such a thing as a Judgment of the World, as you and I believe, if there are signs that will be produced before that particular destruction of the old world, how many signs do you know of today that have not been fulfilled that must now be fulfilled? If you know one sign that the Bible refers to that has not as yet taken place, point it out to me. Allah came to us from the Holy City Mecca, Arabia, in 1930. He used the name Wallace D. Fard, often signing it W. D. Fard. 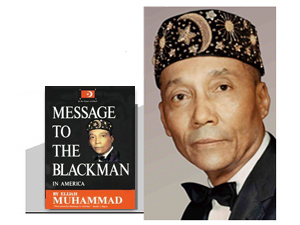 In the third year (1933), He signed his name W. F. Muhammad which stands for Wallace Fard Muhammad. He came alone. He began teaching us the knowledge of ourselves, of God and the devil, of the measurement of the earth, of other planets, and of the civilization of some of the planets other than earth. He measured and weighed the earth and its water; the history of the moon; the history of the two nations, Black and White, that dominate the earth. He gave the exact birth of the White race; the name of their God who made them and how; and the end of their time, the judgment, how it will begin and end. He taught us the truth of how we were made “slaves” and how we are kept in slavery by the “slave-masters” children. He declared the doom of America, for her evils to us was past due. And that she is number one to be destroyed. Her judgment could not take place until we hear the truth. He declared that we were without the knowledge of self or anyone else. How we had been made blind, deaf and dumb by this White race of people and how we must return to our people, our God and His religion of peace (Islam), the religion of the prophets. We must give up the slave names of our slave-masters and accept the name of Allah (God) or one of His divine attributes. He also taught us to give up all evil doings and practices and do righteousness or be destroyed from the face of the earth. He taught us that the slave-masters had taught us to eat the wrong food and that this wrong food is the cause of our sickness and short span of life. He declared that he would heal us and set us in heaven at once, if we would submit to Him. Otherwise he would chastise us with a severe chastisement until we did submit. And that He was able to force the whole world into submission to his will. He said that he loved us (the so-called Negroes), his lost and found, so well that he would eat rattlesnakes to free us if necessary, for he has power over all things. I asked him, “Who are you, and what is your real name?” He said, “I am the one that the world has been expecting for the past 2,000 years.” I said to Him again, “What is your name?” He said, “My name is Mahdi; I am God, I came to guide you into the right path that you may be successful and see the hereafter.” He described the destruction of the world with bombs, poison gas, and finally with fire that would consume and destroy everything of the present world. Nothing of the present world of White mankind would be left. Those escaping the destruction would not be allowed to carry anything out with them. He pointed out a destructive dreadful-looking plane that is made like a wheel in the sky today. It is a half-mile by a half- mile square; it is a humanly built planet. It is up there and can be seen twice a week; it is no secret. Ezekiel saw it a long time ago. It was built for the purpose of destroying the present world. He also hinted at plaguing the world with rain, snow, hail, and earthquakes. He spoke with authority, not as one who is under authority but as one independent. He said the world’s time was out in 1914, but people could get an extension of time, depending upon their treatment of the righteous. He declared that there can be no judgment until we (the so-called Negroes) hear Islam, whether we accept it or not. This includes the history of the world and a knowledge of God and the devil. He condemned the teachings of God not being a man as a lie from the devils for the past 6,000 years; he said that Christianity was a religion organized and backed by the devils for the purpose of making slaves of Black mankind. I also bear witness that it certainly has enslaved my people here in America, 100 percent. He chose me to bear the message of life (Islam) to my people here. Islam is our salvation. It removes fear, grief, and sorrow from any believer, and it brings to us peace of mind of contentment. The greatest hindrance to the truth of our people is the preacher of Christianity. He will not accept it, nor is he content to let others alone who are trying to accept the truth. He is the man who stands in the way of the salvation of his people, and as soon as the people awaken to the knowledge of this man in their way to God, freedom, justice and equality and stop following him, the sooner they will be in heaven while they live.